Promotion in academic rank is a means by which the University encourages, recognizes, and rewards faculty members for excellence in the performance of their duties. A promotion is not a routine reward for satisfactory service but reflects a positive appraisal of high professional competence and accomplishment. Promotion decisions may be made separately from tenure decisions. Each appointment or promotion of a member of the academic staff shall be made upon the basis of merit and the special fitness of the individual for the work demanded by the position. All appointments, reappointments, promotions, and dismissals of members of the academic staff shall be made upon the authority of the President, subject to the approval of the Board. 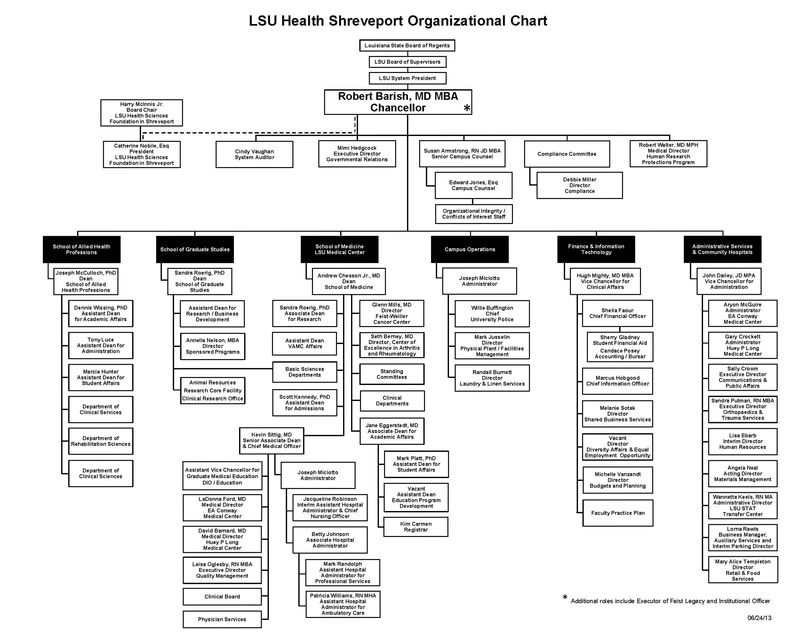 In addition, specific criteria for promotion are outlined in Permanent Memorandum 23 (PM-23 [http://www.lsusystem.edu/index.php/policies/permanent-memoranda/]) and Section 3.0 of the Faculty Handbook. Each School within the University may stipulate more definitive standards and procedures than those delineated in PM-23, provided they do not conflict with this policy. Instructor to Assistant Professor - Normally a minimum of three years* in the rank of Instructor. Although a Department Head, Dean of the School, or the faculty promotions committee may recognize superior service by recommending early advancement in rank and the University may concur (by offering early advancement in rank), individual faculty members ordinarily will not be considered for advancement before the minimum length of time in current rank has been completed. While the formal request for promotion of a faculty member is normally initiated by the Department Head, the faculty member or the departmental promotions committee may also begin the process. Each department must have a defined process for evaluating faculty members proposed for advancement. This process must involve the appropriate senior faculty of the department. If a faculty member has an appointment in more than one Department or School, the request for promotion is initiated by the Department Head in which the primary appointment is held. Promotions of Department Heads are initiated by the Dean of that School. Requests for promotion can be withdrawn at any point in the Health Sciences Center’s process with the mutual consent of the candidate and respective Department Head. Each School of the Health Sciences Center, except for the School of Graduate Studies, has a faculty committee composed of senior tenured faculty members who are responsible for making recommendations to the Dean concerning the promotion of its faculty. The recommendation of the committee relative to promotion will be based on documentation contained in the promotion review file. This file shall contain a current Biographical Data Form including documentation of accomplishment in scholarly, other professional activities and community service, as well as evidence of instructional effectiveness in the form of an Educator’s Portfolio. The file must include letters of recommendation and other evidence that the candidate has met the various criteria (see Handbook Sections 3.0 and 7.0 ) necessary for promotion as required by individual Schools. The committee also has the right to consult experts, either from within or outside the University, for information that might aid them in their evaluation of the candidate for promotion. For promotion to Professor or Associate Professor, inclusion of letters of recommendation from outside the LSU System is required. The candidate for advancement may provide the names of potential sources of such outside recommendations. Normally, the material in the promotion review file will only be available to the faculty member, appropriate committees and councils, and those administrators whose approval is officially necessary for implementation of the committee’s recommendation. The faculty candidate must participate in the preparation of the biographical and supporting documentation that accompanies the Louisiana State University System: Promotion/Tenure Review Request Form, herein and after referred to as the Promotion/Tenure Form, including a signed Promotion and Tenure Verification Page, which can be found at http://lib-sh.lsuhsc.edu/files/teach/verification.doc, indicating that he has reviewed the file and that it is accurate and complete. The requisite Letters of Recommendation are added to the file at this time, and the completed packet is then delivered to the departmental committee, Department Head, and school committee for review. Applications for advancement in rank must be accompanied by a recommendation from the departmental promotions committee and Department Head(s). These recommendations should specifically address the degree to which the candidate meets the appropriate criteria (see Handbook Sections 3.0 and 7.0 ). The vote of the departmental promotions committee must be indicated on the form for promotion. Candidates who receive negative recommendations by the departmental promotions committee faculty and the Department Head can request review by the School committee. Decisions regarding promotions represent a succession of judgments as to whether the candidate meets the criteria set forth in Handbook Section 3.0 and 7.0 . Promotion requests are submitted by the Department Head to the Dean of the School on the Promotion/Tenure Form. A Standardized Biographical Data attachment must also be submitted. Requests are preliminarily reviewed by the Office of the Associate Dean for Academic Affairs for completeness and accuracy and forwarded to the faculty promotions committee of the School. This committee returns a recommendation to the Dean. Positive committee recommendations, with which the Dean concurs, are submitted to the Chancellor and with concurrence, the Systems office. Negative recommendations of the faculty promotions committee, with which the Dean concurs, are returned to the Department Head, who may appeal the decision in accordance with School policy. The Dean of the School may agree or disagree with recommendations. The above decisions are indicated on the Promotion/Tenure Form and appropriate signatures are affixed. When the above process has been completed within the School, even if the Dean’s recommendation is negative, the recommendation is then forwarded for consideration by the Chancellor, the Vice President for Academic Affairs, and the President of the LSU System. Positive recommendations, at the Systems’ level, are forwarded for final action to the LSU Board of Supervisors. If a faculty member has an appointment in more than one Department or School, each Department or School involved must participate in the promotion process (i.e., review by the appropriate faculty committees, Chairmen, and Administrative Councils of all Schools/Departments involved). Unless extraordinary circumstances prevail, when a Recommendation for Promotion is approved by the Board of Supervisors, the promotion in rank takes effect at the beginning of the next fiscal year. Recommendation for promotion and/or tenure of faculty with multiple-campus appointments: a split recommendation for tenure will result in the approving campus acquiring full financial responsibility for the individual; a split recommendation for promotion of a tenured individual will result in the approving campus assuming responsibility for the additional percentage.